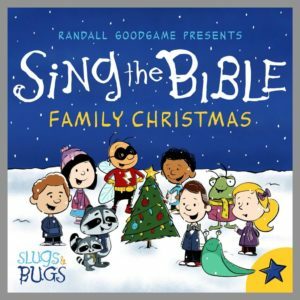 I’m delighted today to feature our good buddy Randall Goodgame’s latest offering from Slugs and Bugs: Sing the Bible: Family Christmas. You might recognize the album artwork as a tribute to “A Charlie Brown Christmas.” The same is true of the music; Randy is a big fan of the jazzy soundtrack by Vince Guaraldi, so he let that inspire his compositions on this album. The result is warm, charming melodies that bring Scripture to light. As with all Sing the Bible albums, this is music the whole family will enjoy. The reason we first became Slugs and Bugs fans is that it was “kids’ music” that didn’t drive mom and dad batty. From the beginning, Slugs and Bugs has been concerned with providing quality, well-made music for children, and this latest offering is no different. This album would be ideal for your holiday family road trip! If you’d like to hear some samples of the entire album, head to the Slugs and Bugs website. Plus — look for special deals in the Slugs and Bugs store this week! Perfect to fill out your own music library or for gift giving!